Home – News – Fall is a Time for Things on Vines! Fall is a Time for Things on Vines! Two great things happen at this time of year: we start turning our grapes into wine, and our neighbors, Sam and Mary Jane Roop, open Brookfield Farm to the public for a fall celebration. 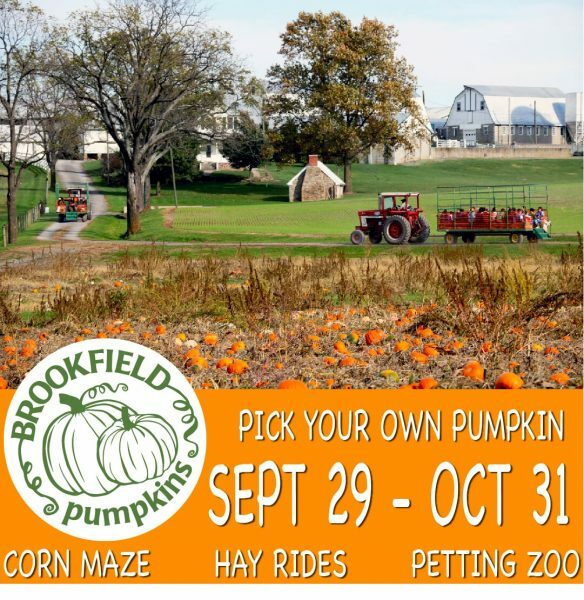 Brookfield offers hayrides to their 15 acre Pumpkin Patch (where you can pick your own pumpkin), a corn maze, a farm animal petting zoo, and other activities to entertain your children. It’s a great experience and an opportunity to purchase the perfect pumpkin for Halloween! So on your way to Links Bridge Vineyards, stop up the road and enjoy a special family adventure that has become a tradition in our area. You’ll find Brookfield Farm at 8302 Ramsburg Rd, Thurmont, MD 21788. The Pumpkin Patch is open Sept 29 through Oct 31. Mon-Thurs 3pm-6pm. Fri-Sun 10am-6pm. Visit www.BrookfieldPumpkins.com for more information.